I am hoping to learn to play a musical instrument (I cannot play anything as yet) that is easy on fingertips and am looking for some suggestions, please. I have psoriasis on my fingertips and it usually spreads to just above the first knuckles. I also get it at the base area between my fingers. I am unable to put too much pressure on my fingertips most days or they will split and bleed, and the same goes for stretching. I am wondering about saxophone, trumpet, clarinet, or maybe flute. If anyone who has experience with these instruments would like to share thoughts on how hard these are on your fingertips I would be most grateful. I am especially wondering if I could play trumpet using my first knuckles rather than fingertips. I would like to learn for only my own pleasure as I have no desire to make a career of it or ever play in public, so if I am mediocre at it, I really won't mind... I will be happy with the achievement for achievements' sake! Thank you all very much for the wide variety of suggestions, there are many ideas that I just never considered. You have all given me a lot of food for thought and the 'out of the box' instruments look very interesting and fun. Regarding the drums, does anyone know how hard the steel drums are on your hands? I looked at YouTube to see some players and the sticks look quite loosely held and not involving the fingertips very much. Finally, can anyone tell me how important the tension/grip is for the mallet instruments? Could they be played with padded gloves or would that mess up the sound? Thank you again. What about the trombone - a "real" orchestral instrument, should you wish to play with community orchestras, but just as at home with bands, etc, and doesn't depend on the fingertips to the same extent as pretty much everything else. I would like to suggest a theremin. It is an electronic music instrument that is played without physical contact. I personally like the sound, see here for example a performance of Over the rainbow. However, since it is less prevalent than many other instruments, it might be difficult to find a teacher in your area. There are DVDs and online resources, though. One potential issue is that playing the theremin requires precise repetitive movement of the fingers which may count as stretching, depending on how severe the OP's psoriasis is. But it's a fun instrument and definitely worth having a try at. A harmonica might work for you. Diatonic harmonicas are very cheap, so there's no real problem if you don't like it. Chromatic harmonicas extend the range and keys available, if you decide you do like it. Panpipes, although typically handheld, are played without putting pressure on the fingers. 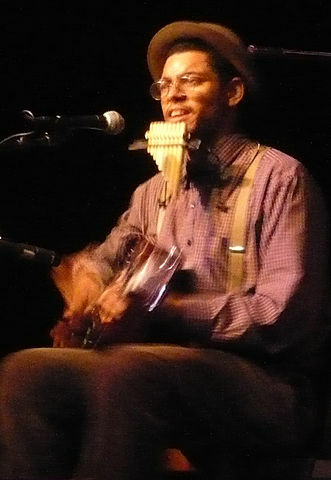 — Image source: Dom Flemons, using panpipes held in a neck rack. Pro: When compared with the other instruments in this list, the flute requires the least force through the finger tips when playing - it's a more 'delicate' instrument, if you will. If these four instruments are your only options, I would recommend avoiding the clarinet and the trumpet. I'd lean towards trying the flute and the saxophone, but even these may be too much for your finger tips to handle. Difficult to find instruments which don't have to be played using fingers/fingertips. It knocks out woodwind, brass, strings, keyboards and some percussion quite easily. Along with slide trombone could go Swannee Whistle. Xylophone or marimba or vibes could also work, using hands to hold sticks rather than fingers. Have you considered a Hammered Dulcimer or a Cimbalom? They are sometimes included in orchestral works - although I can't name one off the top of my head - and there are also "Dulcimer Orchestras" around - look on YouTube. I also agree with @Marzipanherz that a Theremin might be suitable. When you tried piano, was the pressure on your fingertips a problem mainly when you played loudly? You could consider learning to play the electronic organ. Most organs have a very light touch compared to piano - indeed, learning to play with a light touch is greatly beneficial to your technique and will in time help you play faster and more accurately. You could also consider saxophone. On a properly set up instrument very little pressure is needed to operate the keypads. The same would be true of any woodwind instrument that uses keypads exclusively. But I would avoid anything like the recorder or clarinet where you need to seal your finger tip against a hole because I expect this would require more pressure. You could also consider any brass instrument. Again, little pressure is needed to operate the valves. I have even seen trumpet players pushing the valves with the middle segment of their finger rather than their fingertips, though I've no idea if this is good technique or not. Don't forget that your voice is also a musical instrument. Definitely avoid any stringed instrument (including guitar) as these are the worst for putting pressure on your fingertips. Maybe a harmonica to begin with? If the problem you have focuses on finger tips this should work fine, worst case you might have a problem to produce effects. If fingers specifically are an issue, drumming may be up your alley. As far as I know, minimal finger use is required compared to other instruments. Maybe not even with a kit, but with other percussion instruments. Play the trombone: need no fingers at all. It's a lot of fun and covers a broad variety of musical directions. Others have suggested using your voice as an instrument. But rather than singing, you could use it in a different way. Using a loop station and effects pedals, you could record voice samples and layer them on top of each other, slowly constructing a song. You'd grunt and hum to make a baseline, click your tongue or hiss for percussion, and vocalise to add some melody. The effects pedals allow you to add all sorts of effects, such as reverb, echo, modulation or distortion, to help you create the sound desired. And probably the best thing about these machines for you is that they can be operated entirely with your feet. You can hold a microphone in your hands, but you could also get one that clips to your shirt to keep your hands entirely free. Here is an example of a street performer using such a setup, and as a bonus he even explains to his audience a bit how it works. You could try something more unusual, like Pipe Drums. As you can see in this example, you use your foot and, unlike standard drums, you hold the sticks with your whole hand, not with your fingers. Look it up on youtube - so many examples. For example this. Not the answer you're looking for? Browse other questions tagged self-learning physical-limitations or ask your own question. What parts of instutional education does a non-institutional student miss? I want to learn the saxophone. How difficult will this be? Does playing a musical instrument indeed benefit the brain? How should a self-taught musician study and reach his goals? Can one be too old to learn an instrument?